Wait, are you serious? Is there a microchip inside of you? Can I get that for my kids yet? I think Katie Couric needs to hear this story. 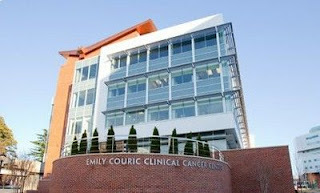 I highly doubt this is the cancer center her sister envisioned! I'm serious, I'm tweeting this to Katie. So glad to know what is going on with our east coast darling; keep up the hilarious writing.....we were in Vermont this month and ALWAYS have great laughs over the Souder visits. Can't wait til you can come again; we promise to invite you in summer instead of crazy cold fall. I'm also surprised the waiting room isn't nicer (although not so surprised about the wait). Don't they have snacks and drinks there for you all? And not getting to see Dr. J really stinks. I hope you have gotten to ask him your questions. And also, I too LOVE to chat with people in the waiting room (love "what are you in for" haha) my husband is always trying to get me to "mind my own business"... It's just not my style. :) Agree with Caroline... Katie oughta get some fresh magazine up in there at least! Hey Girl, you are just tooo funny! I hope you will write a book from this experience; you certainly have the gift. It is written somewhere that humor is a great source of medication. LOL over this recent description, which could qualify for a mini series human interest in the local newspapers. For the rest of us, forewarned is forearmed. We'd bring a fully-loaded iPad. You better call Susan G Komen about the waiting room - I think their mission is to make cancer glamorous and pretty - right!? Kate, I don't have words for what you go through, but I love the way you share it with us. Thanks for that.